First some background information. Absol is one of my absol-ute haha favorite Pokémon and I've been wanting and meaning to do a gijinka (human version) of it since 2010. I drew my first gijinka version of Absol back in the start of 2010. It was basically a kimono style shirt with a fluffy collar, black gloves, a black sash tied in a ribbon at the back and white pants and generic black shoes. The hair was white and short (neck length) and layered with medium long bangs. Red eyes of course. Pretty boring right? Not so interesting although it wasn't really terribly bad either. At the end of 2010 I redesigned it slightly; the pants, gloves and sash were the same and the shoes were pretty similar too. But I changed the kimono style shirt into a keikogi (with the tie at the chest) but the collar was still fluffy. Also added a black headband and the white hair was slightly past the shoulders and smoother, medium bangs still. I had planned to make this second design for a long time until last week when I started thinking about redesigning my Absol gijinka for the third and hopefully last time because it still felt.. lacking and bland... and just not so interesting. Well eh jag ser inget svart på den bilden du visar tro aldrig jag har sett något svart på Absol innan inte på kroppen. Gör en! Det är skitkul att designa gijinkas! 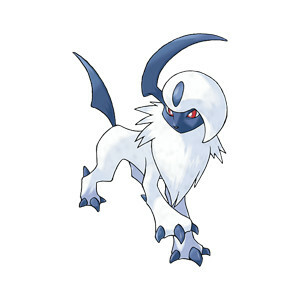 Heheh, I hope I can do Absol for next year!